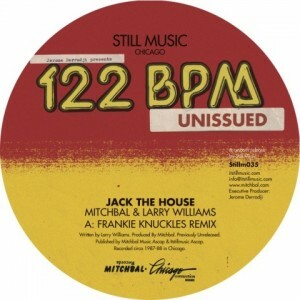 “Jack The House” is a manifesting track title for Chicago house, used by Fast Eddie, Femme Fion and probably many others. All that is about the jack and the house. Working together in various productions, Mitchbal and Larry Williams recorded in 1987 their own “Jack The House”, now being released for the first time by Still Music. For a remix duty they managed to attract no lesser than Frankie Knuckles, the Godfather of House Music, who hits with Kevlar bass line and decorates sweaty Chicago Warehouse with Rimini disco balls. Because of italo factor it could be placed in the mid-1980s German dance chart but dominant drums, groovy synths and a choir of sirens lend genuine Chicago feel. The B-side’s vocal and instrumental versions offer slight variations and are mainly repetition of the kicking flip side. Let your body boogie for me, baby.